You’ve recorded some TV programmers on your Tivo DVR, after transferring the Tivo recordings to your computer with Tivo Desktop. You may come the idea to stream and play the Tivo files on your WD TV Live media player. The bad news is that the WD TV lacks the ability to play the Tivo files. The main reason is that Tivo files are proprietary format which are decrypted by the Tivo company. To get them played on WD TV, you will first need to remove that copy protection and also convert the Tivo files to WD TV playable digital file formats. How to remove Tivo recordings copy protection? For those people who are looking for an easy way to get the job done with just few clicks, we highly recommend Pavtube Video Converter to you. 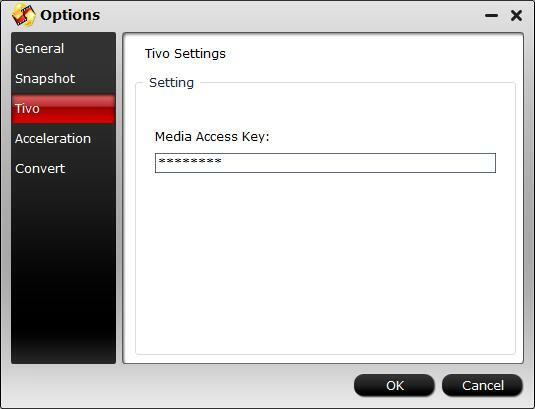 What you need to do is finding your Tivo MAK (Media Access Key) by going to Messages & Settings > Account & System Information > Media Access Key on your Tivo. Then initiate our application on your computer, click the “Options” button on the main interface, in the opened window, navigate and click “Tivo”, copy and paste the Media Access Key for the protected Tivo files in the frame, hit the “OK” button, then you will get a non protected Tivo files. After you’ve removed the copy protection from Tivo recording files, you can then go to the next step: transcoding Tivo to WD TV playable file formats. The Tivo recording files are stored using MPEG-2 compression codec, which is not included in WD TV supported file formats. Here, you can still use our best Tivo Video Converter listed above to perform the format conversion process. The program supports batch conversion mode, so that you can load multiple Tivo files into the application for conversion at one time to save your precious time. 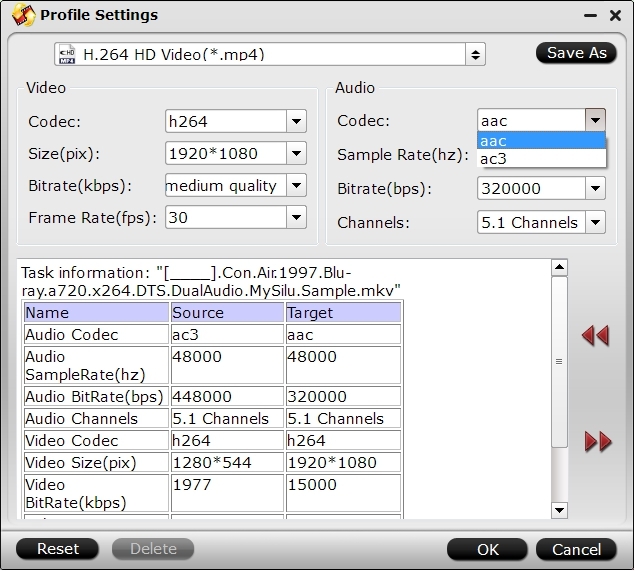 The program can assist you to convert Tivo MPEG-2 files to WD TV most favorable H.264 video codec and AAC audio codec. Tips: The program supports hard-ware encoding acceleration, so that you can get up to 6x H.264 codec encoding speed as long as your computer runs on Graphic card that supports Nvidia CUDA or AMD App technology. For Mac users, you can switch to download Pavtube Video Converter for Mac to perform the conversion on macOS High Sierra, macOS Sierra, Mac OS X El Capitan, Mac OS X Yosemite, Mac OS X Mavericks. Start the program on your computer, hit the”http://www.multipelife.com/wp-content/uploads/2014/11/options-button.jpg”button on the top main interface, in the pop out window, enter the Media Access Key for the Tivo files, then press the “OK” button. Step 3: Output WD TV supported video format. From “Format” drop-down list, select “HD Video > H.264 HD Video(*mp4)” as the proper video file format to play on WD TV media player. Step 4: Adjust output video and audio codec. Click “Settings” to open “Profile” settings window, under “Video” section, click “Codec” drop-down list, select WD TV favorable H.264 video codec, from “Audio codec” drop-down options, select AAC codec for WD TV Live. Go back to the main UI and click “Convert”button to start Tivo to WD TV Live supported format conversion process. When the conversion is completed, click “Open Output Folder” on the main interface to pop out the folder with your converted files, you will then have no problem to play Tivo files on WD TV media player. How to Stream Local Video/Movies to TV via Xbox One?